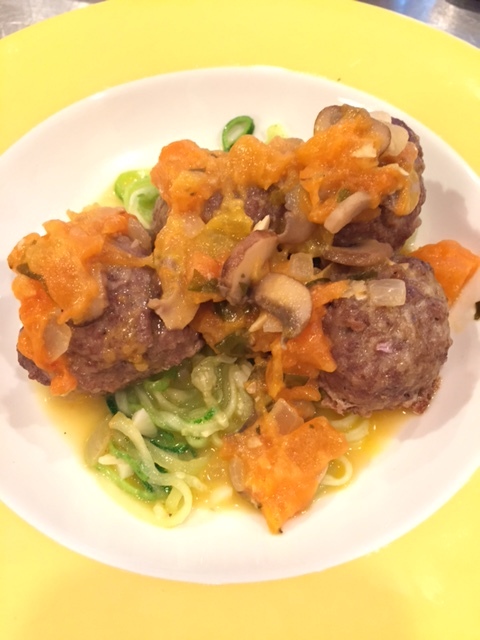 Last night we used the yellow marinara sauce over meatballs and zoodles. Absolutely delicious! Powering through my new ketogenic cookbook, I spent a lovely evening making a marinara sauce for two dishes I’m making – Meatballs with Zucchini Noodles and a Pizza Casserole (recipe coming). I love tomatoes, especially tomato-based sauces. While I’ve tried making my own sauce, it was mostly cooking down diced roma tomatoes in olive oil for a few minutes. Nothing to write home about. Typically I’d just hunt the grocery store for the lowest carb sauce I can find. Not an easy task as many include added sugar. Then I discovered the Yellow Marinara Sauce in The Ketogenic Cookbook. Intrigued, I was nervous about trying this recipe. Why? Peeling tomatoes. I’ve never done that before. It always seemed like an impossible task. Sure enough the peeling went smoothly and the recipe is so simple yet delicious. But what really excited me was the endless possibilities. As I followed the directions, I immediately started thinking of what I could add to these sauces the next time. A red pepper/yellow tomato combo. Maybe puree the tomato but adding chunks of zucchini and yellow squash with diced eggplant. Yes, before even tasting the final product I was already thinking of playing with the recipe to make it my own. That’s always a good sign when trying something new! Turns out the biggest pain I experienced was finding yellow tomatoes. The recipe calls for 5 lbs. of yellow tomatoes. I could find red tomatoes everywhere. Heck, even green tomatoes were out. Clearly September isn’t yellow tomato month. So why the fuss over yellow tomatoes? For those staying under 20g of carbs, you know the problem with tomato sauce or soup — too many blasted carbs! That’s where the yellow tomatoes come in. They are lower in carbs than their red counterparts. So the hunt was on! I ended up going to 4 different grocery stores and a local farm before finding yellow heirloom tomatoes at Whole Foods. So this morning I need to recalculate the carb, fat and protein count for my version of the sauce. But that’s OK. I just wanted to get this particular recipe under my belt. All of the ingredients and quantities below reflect the carb/fat/protein counts from the recipe. *I ended up using yellow heirloom tomatoes and 1/2 cups of button and baby bella mushrooms. Those changes will shifted the macronutrient numbers. Use fresh herbs when possible for better taste. *I found the 2 tsp of red pepper flakes tends to over power the overall flavor when you try it immediately after cooking. I ended up adding heavy cream, bottled the sauce and let it sit in the fridge for a couple of days. Perfection! **I skipped the stevia. The flavor is amazing without it. Boy, was I wrong about how the difficulty of peeling tomatoes. I peeled 5 lbs. in under 5 minutes. While bringing a large pot of water to a boil, prepare an ice bath in a large bowl. Remove the tomato stems. Using a paring knife, cut a small X on top of the tomatoes. Drop them into the boiling water (use a slotted spoon to avoid splashing hot water on you (ouch!) for about 10 seconds. Then remove tomatoes from boiling water (again with slotted spoon!) and place them in the ice water bath. Suggest you do 1-3 tomatoes at a time. Peel the tomatoes – the skin blisters a little and peels off easily! If the remaining stems are woody (mine were), remove them and quarter the tomatoes. Remove the seeds and pulp. Then roughly chop up the quarters. The sauce is easy to make. After heating the tallow and browning the onions and mushrooms, just toss everything else in and simmer on low for 2-3 hours. Easy peasy! Place your oil in a large stockpot over medium heat. Add the onion and sauté for 15-20 minutes. Be sure to stir often so you don’t burn the onion. You just want a nice dark brown color. Add a pinch of salt to the onion to help draw out moisture from the onion, helping it caramelize. Add the mushrooms and garlic to the onions and sauté until the mushrooms are soft. Add the tomatoes, fresh herbs (leaving the sprigs whole), bay leaves, red pepper and salt. Stir ingredients. Turn the heat to low and simmer for 2-3 hours or until the tomatoes are cooked down and start to darken. When finished, remove sprigs and bay leaves. If you are using the Stevia, add it here and mix well. Storage – Store in the refrigerator in an air-tight container for up to a week…if it lasts that long. Note: The recipe makes a lot of sauce. I ended up gifting a pint to friends. I’m hoping for a review in about a week or so. This entry was posted in Cooking Prep, Food, Recipes, Rubs & Marinades and tagged ketogenic diet, LCHF diet, low carb marinara sauce, The Ketogenic Cookbook. Bookmark the permalink.